The Seattle Seahawks visit the New York Giants in Week 7 of the 2017 NFL season. PFF previews the top player matchups of the game. QB Russell Wilson vs. Giants Cornerbacks – In his last game against the Rams, Russell Wilson had his lowest passer rating of the year at 76.2 and his second-lowest graded game of the season at 75.5. In that game, Wilson was 10 for 15 against the Rams’ corners with only 81 yards and a pass defended, while he was 10 for 12 against the Colts in the previous week for 142 yards and a touchdown. Wilson’s matchup against the Giants will bring in a group that just defended three passes and had an interception in Week 6 without one of their primary slot corners. The passing game will be important against a team with one of the best run defenders in Damon Harrison up the middle, who has the fourth most run stops among defensive tackles with 11. WR Doug Baldwin vs. CB Dominique Rodgers-Cromartie – With the suspension of cornerback Dominique Rodgers-Cromartie over, Baldwin will face a lot of him as he lines up over the slot 65 percent of the time. Before his suspension, Rogers-Cromartie had allowed an average of 0.89 yards per coverage snap in the slot with 109 snaps in coverage, while Baldwin had been averaging 1.65 yards gained per route run from the slot, seventh in that time span. Baldwin has yet to score when lining up in the slot, while Rodgers-Cromartie has yet to allow a touchdown while in slot coverage. 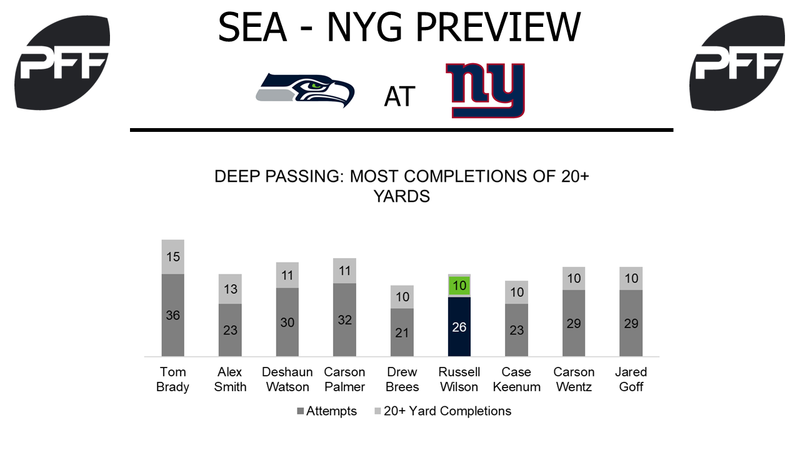 Seattle Halfbacks vs. Giants Run Defense – Currently, Seattle’s quarterback Russell Wilson has five more run attempts than the next closest Seahawks running back, which is Eddie Lacy at 25. The running backs on the team are averaging only 3.0 yards per carry through their five weeks with 52 combined attempts and will face the highest graded run defender among interior defenders in Week 7 in Damon Harrison (92.1). This Giants run defense just allowed an average of 2.6 yards per carry up against a duo in Jamaal Charles and C.J. Anderson that combined to average 4.8 yards per carry heading into their matchup. 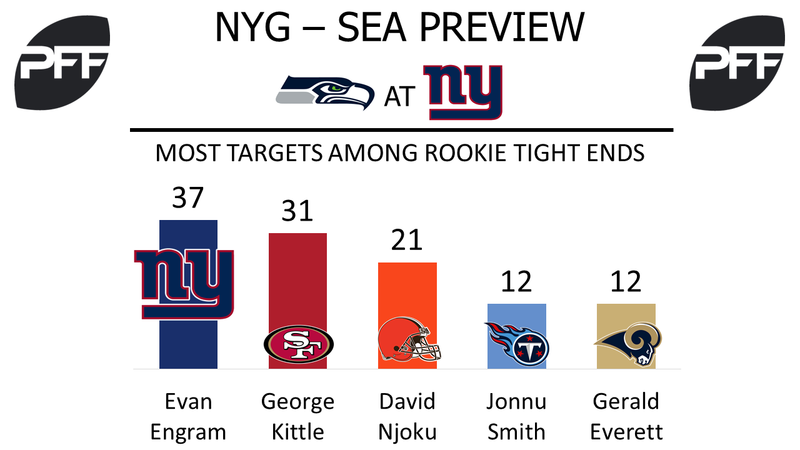 TE Evan Engram vs. LB Bobby Wagner – Rookie tight end Evan Engram has been a substantial part of the Giant’s offense through six weeks. Engram’s 37 targets this season leads everybody not named Odell Beckham Jr. on the Giants, and currently ranks fourth among 38 qualifying tight ends (first among all rookie tight ends). He’s had more snaps in route (198) than any other tight end in the league. Bobby Wagner has been prolific this season, fielding an overall grade of 92.0, the highest among 83 qualifying linebackers. His coverage grade of 90.9 is the highest among linebackers. Although this is projected to be a tough matchup, with a depleted receiving core and a running game that still has some questions, look for Engram to continue to be a focal point of this offense. Giant’s WRs vs. Seattle’s secondary – Roger Lewis and Tavarres King combined for two receptions and 22 yards in Week 6. This may not get any better with Seattle’s secondary coming to town. Kam Chancellor currently ranks sixth among 81 qualifying safeties with a coverage grade of 87.4. Earl Thomas isn’t far behind, with his coverage grade of 87.0 being good for eighth. Cornerbacks Richard Sherman, Shaquill Griffin, and Justin Coleman have all had serviceable seasons, with each grading above 74.0. For comparison, Lewis and King have overall grades of 55.4 and 47.8 in limited action this season. It’s hard to imagine the Giant’s continually testing this secondary on Sunday. T Justin Pugh vs. Dl Michael Bennett – Justin Pugh has allowed 14 total pressures this season, giving him a pass-blocking efficiency (measures pressure allowed on a per-snap basis with weighting toward sacks allowed) of 93.2, which ranks 54th among 69 qualifying offensive tackles. He allowed five total pressures last week, giving him the second lowest pass-blocking efficiency of the week (81.8). Michael Bennett’s run-defense grade of 81.6 has him ranked 27th among 122 qualifying interior defenders. Pugh will have his hands full each time he finds Bennett across him.